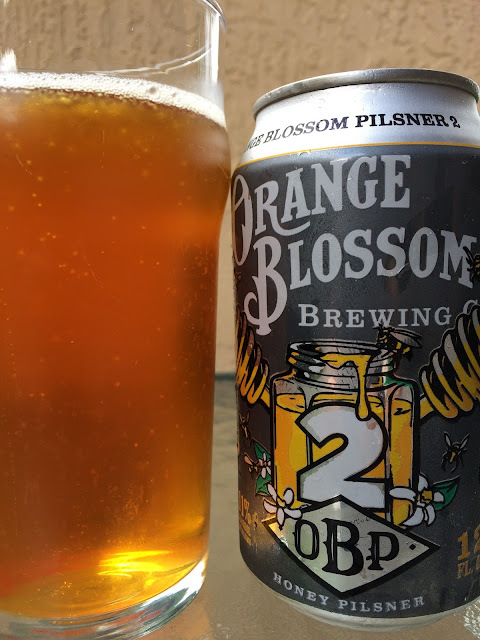 When I was up at Brew Hub in Lakeland, FL a few months ago, I asked for Orange Blossom Pilsner 2 but it was unavailable at the time. They are currently brewing OBP2 for Orange Blossom Brewing. So I picked up a can recently to check out. The can has a fun little scene with honey combs, bees and a jar of honey. That's because this beer is brewed with "Half the Water. Twice the Awesome." That awesome being a double-dose of honey. "It's the bee's knees, brahs." 11% alcohol. Big honey, big alcohol aroma. Rich honey flavors come first, syrupy and thick texture. Candy and fruit flavors are secondary, and you will not mistake the alcohol streak from start to finish. Honestly, this has no characteristics of a pilsner. Tastes more like a tripel hybrid of some sort. Anyway, regardless, much too sweet, like way beyond OK. Obnoxiously alcoholic, almost a shiver, and expect a lingering hot alcy burn in the throat. Sorry, big dump!